Shiny black loafers by Anne Klein in very good condition. See photos for details. As seen in the photos, these shoes are beautiful and have NEVER been worn. They and are sure to turn heads; made with the undeniable style and quality Tory Burh is known for. BROWN LEATHER W/ BROWN PATENT LEATHER ACCENTS ON THE FRONT AND BACK. If there are any problems with your item we would greatly appreciate the opportunity. Rubber flip-flop with leather sole. Iconic love knot detail on vamp. 1/2" heel height. Two-tone color. These shoes are inGOOD CONDITION : Upper shows moderate wear and light soil with the emblem on the left shoe is coming off See Photos. Intimates and Sleepwear. Designer/Label - Cole Haan. Ann Taylor LOFT. Kate Spade. Heel Type - Wedge. Jimmy Choo. Special Details - Slip On, Open Toe, Minor Wear On Soles And Insoles, Excellent Condition. Designer/Label - Diana Broussard. Intimates and Sleepwear. Style - Slingback Heels. Kate Spade. Special Details - Buckle Closure, Minor Scuffing On Heels, Minor Wear On Soles And Insoles, Good Condition. 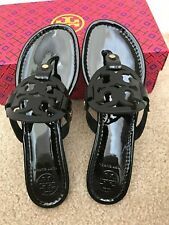 COLE HAAN BLACK PATENT LEATHER FLAT SANDAL WITH ANKLE STRAP • SIZE 10 B!!! COLE HAAN BLACK PATENT LEATHER FLAT SANDAL WITH ANKLE STRAP AND NIKE AIR TECHNOLOGY • SIZE 10 B! FULLY LEATHER LINED WITH A CUSHIONED LEATHER INSOLE AND A GRIPPING RUBBER SOLE! LIGHTLY WORN AND LOOKS ALMOST NEW! Intimates and Sleepwear. Designer/Label - Nina. Ann Taylor LOFT. Kate Spade. Style - Open Toe Heels. Jimmy Choo. We have a large selection of clothing, shoes, belts and handbags. With over 2000 of the most desirable labels in our inventory, you’re bound to find lots of rare and hard to find pieces as well as common necessities. Strappy upper. Heel length 100% black leather upper. Size: Misses size 10. side buckle. open toe front. Intimates and Sleepwear. Style - Slingback Heels. Kate Spade. We have a large selection of clothing, shoes, belts and handbags. With over 2000 of the most desirable labels in our inventory, you’re bound to find lots of rare and hard to find pieces as well as common necessities. NEW WITHOUT BOX TALBOTS GENUINE LEATHER SHOES SIZE US 10M. WE WOULD BE MORE THAN GLAD TO RESOLVE THE PROBLEM. 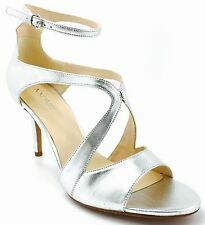 Made by Kenneth Cole Reaction, these sandals are a great find! They are light gold colored. It has a zipper up the back and is the open toe style. Wearable with a dress, shorts or pants! Great for any dressy or casual get together! Shellys London Blue Glitter Tami Platform Heels. Color differs between computers and phones based on settings, brightness, etc. ( Color may vary slightly due to computer/phone resolution. Size: 40, US 10. ). NEW Rieker Cognac Brown Draped Leather Shoes 42. Lovely shoes from Rieker in cognac brown leather. Draped leather upper with decarative button detail. manmade sole and heel. leather lining. New and unworn, no box. New with tags. authentic UGG boots. Height is to calf. Only tried on. This is a distressed leather ugh slip on boot with buckles. ALEX ALEX Burnt Orange Classic Suede Espadrilles. Versatile espadrilles crafted from soft suede. Suede upper. Slip-on style. Size 10 fits like 9.5. Viscata seeks out all natural materials to elaborate your pair of espadrilles. LUXURY OF THE HANDCRAFTED - Viscata Handcrafts High Quality, Authentic Designer Espadrilles, that are Made in Spain. Choose from Over 50 styles! Size - 10M. Color - Orange Coral. SEE PICTURES FOR VISUAL CONDITION & CONDITION OF SOLE (USE ZOOM). Material - Leather.